The Sheriff of Nottingham has hit on the perfect plan to finish Robin Hood off once and for all … Accusing the outlaw of witchcraft, he invites a malevolent gang of witchfinders to Nottingham to track him down. 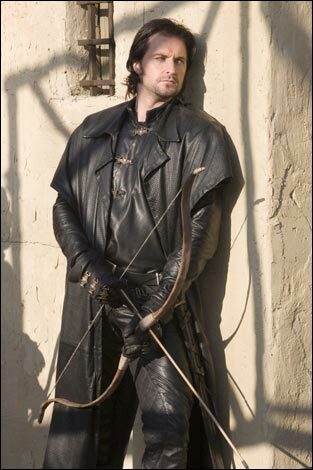 Sir Guy of Gisborne leads the hunt – but he has problems of his own. Since the day Marian died, his dreams have been haunted by images of the woman he loved, and now he’s seeing her in the waking world. If the witchfinders discover Gisborne’s secret, will he be the one to find himself burned at the stake? Oh, eBay, how sweet the sound! I originally bid on all six CDs, lost all the auctions and then found two of them from another seller as Buy Now, so I Bought Now (Then). Fortunately, it turned out that I did actually buy the only two of the six narrated by Richard Armitage – the remainder are read by the actors playing Much, Tuck and Robin. Although I’m curious about those now as well, actually. Now there’s something I honestly didn’t expect! I mean, I only got these because they were read by Guy/Richard! The audiobooks are set during season three, but are not actually episodes that were a part of that season. The things you hear are not things you will have seen on TV. It would seem The Witchfinders is set in the beginning of season three, after Robin’s return to the land of the living, but before Guy gets carted off to Prince John (now there’s a thought – has Toby Stephens done any audio books? ), but unsure exactly when. This is based on the Sheriff being present, Isabella being absent and Guy being haunted by Marian’s spirit. Oy vey, you should hear him angst about it. It’s a real emo fest! And I freakin’ love Guy even more for it. The story is pretty good – hey, it’s got witches! Or actually, it’s got one suspected witch (Kate, haha!) – but the thing that strikes me the most is the reading itself. Richard Armitage can act, yes, but he gives every single character their own voice, and what’s more, you recognise them from the show! Maybe not so much Marian and really not Tuck, but then again, Tuck was a newbie so the other actors hadn’t heard him as much. You clearly hear Guy (obviously), the Scottish brogue of Little John, the cockney of Alan, the brusque Sheriff (a bit too brusque for my liking, he doesn’t bark like that all the time), Robin, Kate, Much … I was sitting in the car perfectly gobsmacked at the sheer skill with which he inhabits all the characters. It’s amazing! Okay, the sound effects don’t feel all that necessary, realistically, but wow, the reader’s voice acting more than makes up for that. So, the story. One of the Sheriff’s soldiers mentions something about witches, and it gives the Sheriff an idea to solve the problem of Robin Hood: get a load of witchfinders and accuse Robin of witchcraft. The people are stupid enough to buy into that sort of thing, he reckons, and some witchfinders come along and seem very impressive. They can tell people things about dead relatives and whatnot (a very un-subtle cold reading), and a little girl says she’s seen a witch, dancing with the devil in the forest: Kate. They test her with a fake needle and of course she feels no pain (it’s retractable), so she’s quickly whisked off to prison and the Outlaws have to try and find a way to get her out before she’s tried and executed. Meanwhile, Guy is hallucinating. He keeps seeing the ghost of Marian and she has issues with what he’s done in the past and what he’s doing to people now. She tries to make him realise that he might be a bad person, but he doesn’t have to be, and he begins to listen to her, however reluctantly it is at first. She guilt-trips him something terribly and he’s very emo about it all, like I said, but I love Emo Guy and the way this “episode” gives us a look inside his haunted mind … it’s everything a Guy fan could want. The story fits in very well with season three. It adds an extra level of depth to the character of Guy and we realise exactly how much Marian’s death is changing him. This story feels like a great big audio hug to me, and I’ve never been overly keen on the show itself in general. Guy is such an excellent example of an archetypal Lost Soul (and a Slytherin, actually, but that’s by the by) and … just … wow. You have to listen to this, if you can get a hold of it. Richard even speaks in (what I believe to be) an Irish accent near the end! BE STILL MY HEART! Now, had that been a Northern Irish accent, I would’ve probably driven off the road, but alas, it’s a southern one, unless I’m confusing it with some sort of West Country accent. Doesn’t matter, I choose to believe it’s Irish because I love the thought that Richard can do (sort of) an Irish accent. Gratuitous Gisborne pic, just because I WANT TO THROW MYSELF AT HIM every time I see this picture and I don’t know why. All that manliness maybe? As an added bonus, which made me all warm and fuzzy inside, it comes with a special feature (! ): an interview with Richard Armitage at the end! They talk about Guy and Robin Hood and Marian’s death and a lot of things. It’s interesting and informative, and took me by surprise, as I had no idea it was there. Stay tuned – I’ve also been enjoying Robin Hood: The Siege. A review coming soon to a blog near you! 5 out of 5 stakes. 3 Responses to "Robin Hood: The Witchfinders by Rebecca Levene (2008)"
OH man. I ordered this from Amazon a couple of weeks ago. A week later, the seller wrote saying they were out of stock. So I start over. Especially after reading your review. Thanks! It gives me an extra push to start over!! I’ve started ordering a lot of these things from TheBookDepository. Love that site! They have really good prices and free shipping worldwide. The stuff comes in a decent time as well. Check it out. I just looked. They have this book for $12.16. The only thing you might need to do is have a paypal account. I cannot use a credit card with that site. I talked to my bank about it, and they said because it’s overseas. Some credit card issuers will not easily let you purchase from that far out of town. I use paypal for everything anyway or at least when I can. That way I’m not keying my card information for all these vendors.